March 26 – FIFA beware, former investigators and prosecutors who worked on the US Department of Justice indictments in 2015 say that the investigation is still on-going and there will likely be more indictments on top of the 42 already charged. One insider to the investigations told Insideworldfootball there was enough evidence and information for the investigation to go on for another 10 years. 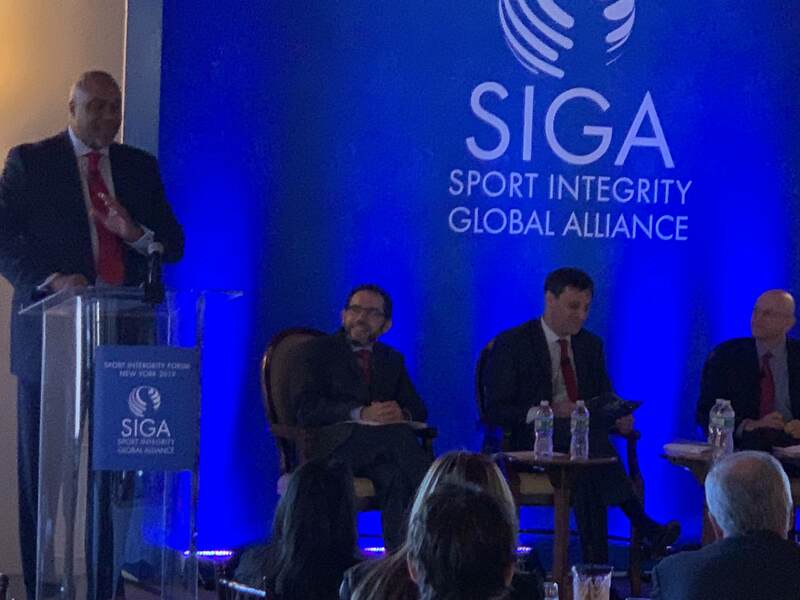 Speaking at the SIGA Sport Forum V in New York a panel comprising Robert L. Capers, former United States Attorney for the Eastern District of New York, Richard Weber, former United States IRS Criminal Investigation Chief, and Paul Tuchmann former Assistant United States Attorney in the Eastern District of New York, and former Deputy Chief of the Public Integrity Section and co-Chair of the FIFA Task Force, spoke about the investigation into the scandal that brought the world of FIFA to its knees. Tuchmann (pictured second right) outlined how the “vast majority of cases came down to bribes that paid for commercial rights”, but included bribes for “site selection” for major tournaments and were underpinned by money laundering. Although reluctant to go into detail, Tuchmann said the FIFA investigations were not finished. Capers (pictured standing) and Weber (pictured right) confirmed the same. The on-going criminal investigations were described as both a “clean-up of the ongoing investigations as well the potential for a new, wider and deeper set of indictments”. The prospect of the new indictments reaching into the current FIFA administration and its operations was not ruled out. Capers and Tuchmann were both bullish that they had succeeded in bringing their ‘targets’ to justice in the US, but they were similarly non-committal on whether having raided FIFA in 2015 the US investigations had left the organisation in a better place. “This (arrests of people from the corruption investigation) is never the answer, we hope it is the catalyst (for better governance),” said Tuchmann. How likely are the US authorities to return to FIFA and football’s seemingly deep dug well of corruption? “If the crime is in dollars then you are going to attract our attention,” said Weber.